Lots of new classes starting up again for 2016, making it a great time to learn a new fibre art! So many fibre arts to try! 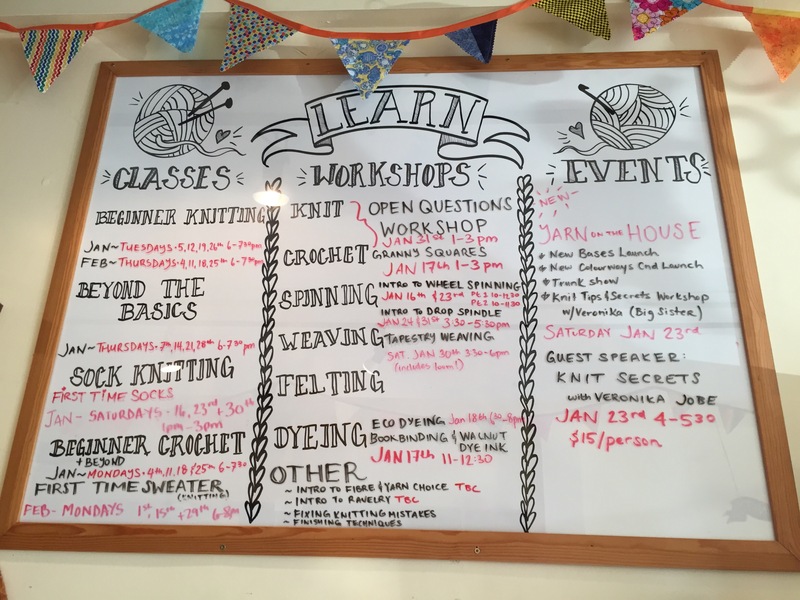 In addition to our monthly knitting and crocheting lessons, we offer eco dyeing (Jan 18th), wheel spinning (Jan 16th & 23rd), drop spindling (Jan 24 & 31st) and table weaving (Jan 14 & 21st). Some NEW classes in 2016 include a Tapestry Weaving workshop happening on Jan 30th that includes the mini loom to take home, and crocheting granny squares for intermediates on Jan 17th. We are also bringing back some local favorites for the intermediate knitter including the First Time Sweater class in February and the Saturday Sock knitter class for first time sock knitters starting on Jan 16th. We are also very excited to present our inaugural Focus on Local Trunk Show, where Veronika Jobe from YOTH (Yarn on the House) will be bringing samples of her gorgeous yarns knit up into beautiful pieces of her own design, as well as showcasing other designers. On Jan 23rd she will be presenting a talk called Veronika’s Knitting Secrets from 4-5:30pm for only $15, but space is limited, so please call or drop in to register. The first of monthly FOCUS on LOCAL Trunk Shows will happen later that same night from 6-8pm. There will be an admission of $5 suggested donation at the door, with partial proceeds going to support a local women’s shelter. More on this to be posting over the next week on our blog. Big sister Veronika Jobe and little brother Daniel Burda are the driving force behind one of our favs, Yarn on the House, YOTH Yarns. Come hear Veronika share her knitting secrets! ← New Year’s Resolution KAL!